The new Wire Feeder, model PW3-WF / 1.5-V2, has been specially designed for dispensing silver alloy with a diameter of up to 1,6 mm. The model PW3-WF / STx.x-v2 is instead designed for the feeding of tin wire alloys, with diameter in the range of 0.8 ÷ 2.2 mm. Small dimensions (the width is 95mm only) and low weight (3.6kg) make it easy to install the Feeder on automatic handling systems. 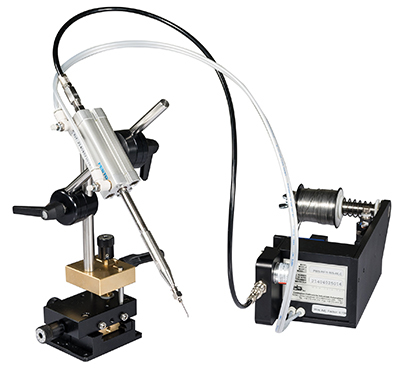 The dispensing nozzle can be mounted directly on the engine output, for a very compact installation, or through a flexible sheath. The wire dragging system consists of two pairs of drive wheels, powered by a strong geared motor. The drive wheels are easily and quickly replaceable; they are available either with a "V" groove for hard alloys (silver), and with a U profile for soft alloys (tin). A WLC (Wire Length Control) integrated encoder for an accurate, reliable and repeatable wire feeding. An easily adjustable pressure regulator with a large indicator to ensure the stability of the operating pressure even in the presence of pressure fluctuations on the compressed air line. The powerful geared motor is also capable of working with very large and heavy reels (ie Ø 300mm, 12kg) to interlock automatic machines where a high degree of automation is required.